Acute water shortage has hit refugees and the host community in Palorinya refugee settlement in Itula Sub-county in Moyo District. 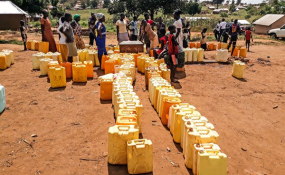 Mr Hassan Kaps Fungaroo, the Obongi County Member of Parliament, told Daily Monitor that the water pumping supply system is not enough after Uganda Red Cross Society officials reportedly dismantled the treatment and supply system in the area. "Uganda Red Cross Society (URCS) has started dismantling the water treatment and supply system at Angalia-Chini in Itula Sub-county and yet the system is in good condition. But the question is at the end of its contract with United Nations High Commissioner for Refugees (UNHCR), should Uganda Red Cross or any other non-governmental organisation dismantle the project facilities established or run by her staff to serve the refuges and host communities for example water tanks, pipes, generators and pumping stations, schools and health centres in the refugees settlement and carry away the parts?" Mr Fungaroo asked. He said this question has come up because at about 5pm on January 15, some staff of URCS, Moyo branch were allegedly seen on a truck carrying away two 30,000-litre water tanks from Angalia- Chini Village, Itula Sub-county in Moyo Town. "But luckily enough, I was in Obongi and I quickly moved to the site to find out the facts and I found the information was correct," he said. Mr Fungaroo said he, and a delegation of Obongi local government leaders, reported the matter to the office of the refugee desk officer in the Office of Prime Minister at Pakele, Adjumani District and discussed the challenges affecting refugee operations. "From Pakele, we were told that, this water treatment plant was established by MSF about two years ago and Uganda Red Cross Society only took over its operations when MSF left the area a year ago. But we were not given the contract agreement between UNHCR and Uganda Red Cross Society to guage the powers Uganda Red Cross has on this and other facilities they managed in the area," Mr Fungaroo noted. He added that Uganda Red Cross Society attempted to dismantle a similar water treatment and supply system at Go-down Village in Obongi Town Council but was stopped by the local authorities last year. "With this trend of events are the other facilities such as schools, health centres, among others, safe? What should we do?" He asked. Speaking to Daily Monitor in a telephone interview, Mr Saviour Leku, URCS's branch manager for Moyo District, confirmed the incident and said they are going to clean the storage facilities. "We are waiting for feedback from our funder UNHCR because our contract agreement ended on December 31, 2018 so we are waiting to see whether to continue or not," Mr Leku said. Mr Titus Jogo, the refugee desk officer, said he was on the way to Moyo District over the same matter. "Let us meet later in the evening and I will brief you about the matter," Mr Jogo said on phone. Mr Simon Peter Anyanzo, the URCS regional manager, West Nile, said water shortage in the settlement is not as a result of the organisation's actions. "We started producing water in Angelia-Chini village since December 2017 to December 31, 2018 and we were using our resources from September last year but we received support from UHNCR through Office of Prime Minister to support water production from October to December 31, 2018," Mr Anyanzo said. He added: "What happened was that UNHCR took a decision to stop water tracking and that is why some villages are experiencing problems of water." Ms Rukia Zaibu, a resident of Angalia-Chini Village said the community was taken by surprise to see the two water tanks taken. "As of now we have resorted to collecting water from the River Nile for domestic use because it's hard to get clean water in the area," Ms Zaibu said.